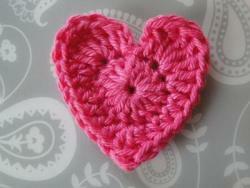 Crochet Patterns and Tutorials by Claire from Crochet Leaf! Crochet patterns take up quite a lot of my free time - thinking them up, writing them down, changing stuff, making mistakes, getting them right... but I love this adventure! So on this site you'll find some of my own crochet ideas and designs, as well as stitch instructions, suggestions for increasing your knowledge of the craft, and all kinds of wonders that I hope will inspire you. I've just added a couple of touches to make the corners a little more square than they usually are with this stitch. Makes a sweet mat for your houseplant - or you could extend the pattern for a table runner or scarf. 18 rounds of repeated stitches in different sizes, worked in one color or a variety of shades. It's a fun pattern to work! 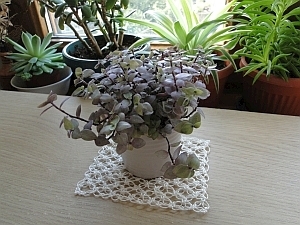 This piece is crocheted in thread, but you could use another yarn of your choice, of course. 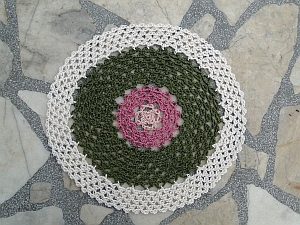 I'm into lacy, flowery mode at the moment as summer arrives - as you can see from my Solomon's Knot Square above. I've also been experimenting with one of crochet's most interesting stitches ... chain stitch! And/or subscribe to my newsletter The Crochet Leaflet, which will tell you about my latest patterns as well as any other news I have to tell you. That way, you won't miss a thing. Thanks for visiting me here - and as ever, I wish you... A Fab Time Crocheting!